We have at AINahrain many contracts in place with many of the world's major ocean carriers in the key trades to/from Asia, USA, Middle East, Europe and Africa. Specialized services to the Iraqi market through our offices in Basra and Baghdad. 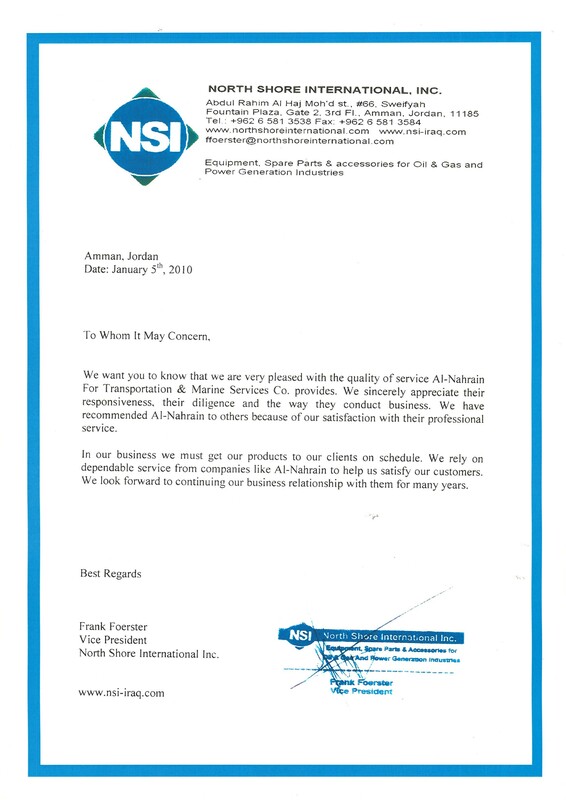 "We are satisfied with the quality of service that Al-Nahrain Co. has provided over the years And sincerely appreciate their responsiveness, diligence and the way they conduct business. 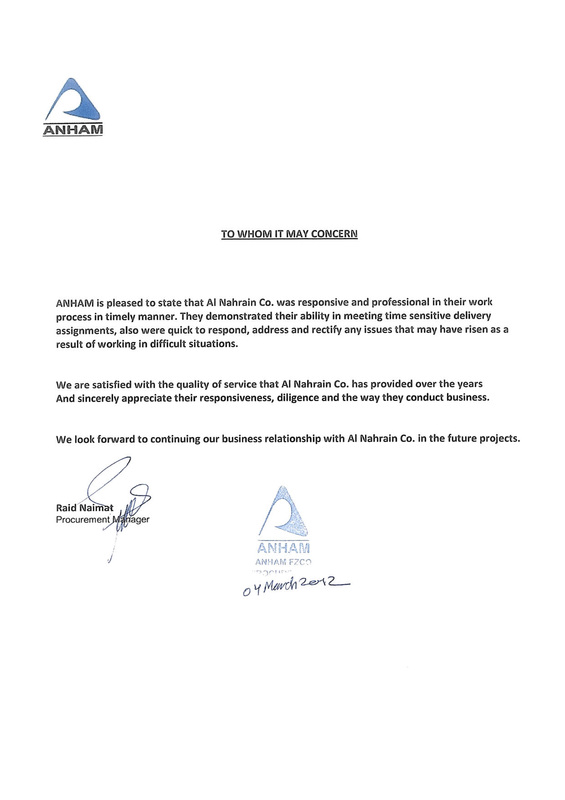 We look forward to continuing our business relationship with Al-Nahrain Co. in the future projects"
During the long course of assigned jobs to Al-Nahrain Co. We have remarkably noticed their prompt response to our requests with distinguished work process, this has clearly reflected the ability in meeting the needs of our sensitive shipments' requirements in timing & keen follow up. 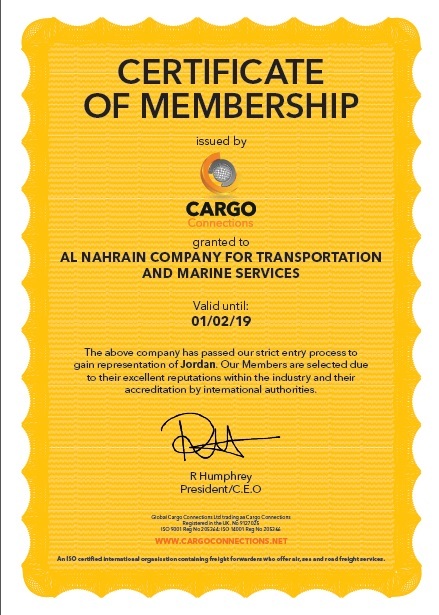 We highly recommend Al-Nahrain Co. to others with our full-confidence for their trust, credibility & responsibility in performing their jobs"
"Al Nuwaira Trading Co. is glad to express its good appreciation for the special performance & professional response of Al-Nahrain Co. for Transportation & Marine Services. During the last seven years of Business Cooperation, Nahrain Co. has conducted & executed all the assigned jobs with their special ability & capability within a remarkable timing & safe delivery to various destinations inside Iraq. We are fully satisfied with the responsibility U professionality which has been clearly shown during the service & performance of Al-Nahrain team. Indeed they have their own specialty in following up the shipments from Door-to-Door supported by timely reports. Al Nuwaira Trading Co. highly recommends the performance & service of Al-Nahrain Co. to others, at the same Time, anticipating more prosperous & developments in future business. " 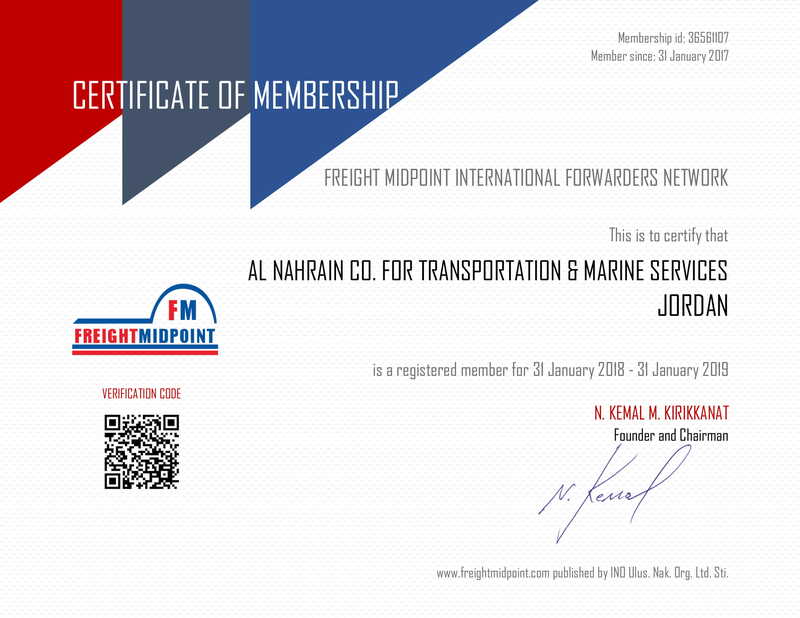 "Kuehne+Nagel Jordan is pleased to state that Al Nahrain Co. have demonstrated a high level of professionalism in providing us with the trucking services for our cluster ( Jordan, Iraq ) needed to conduct our business. Their ability to meet deadlines, constant follow up and customer service play a significant role in their success. We are satisfied with the quality of services they have provided with so far and we appreciate the effort they put into handling our business. 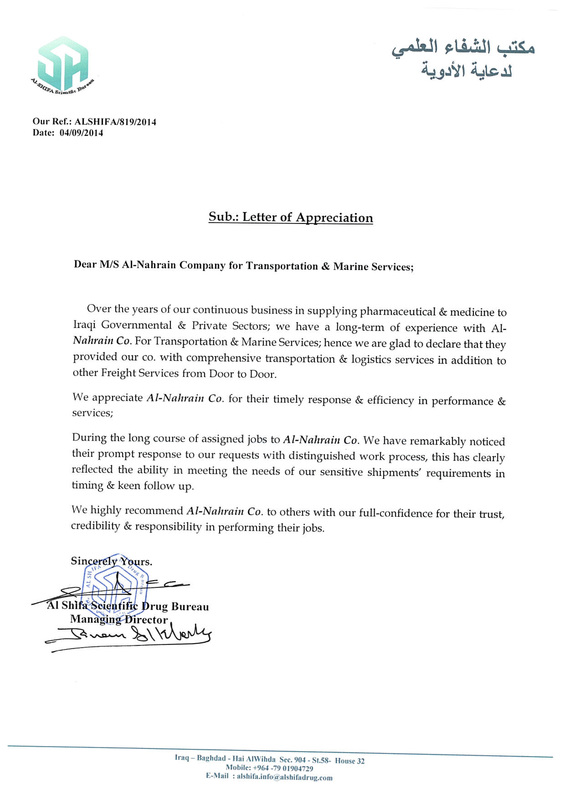 Kuehne+Nagel Jordan recommends Al Nahrain Services to others. " 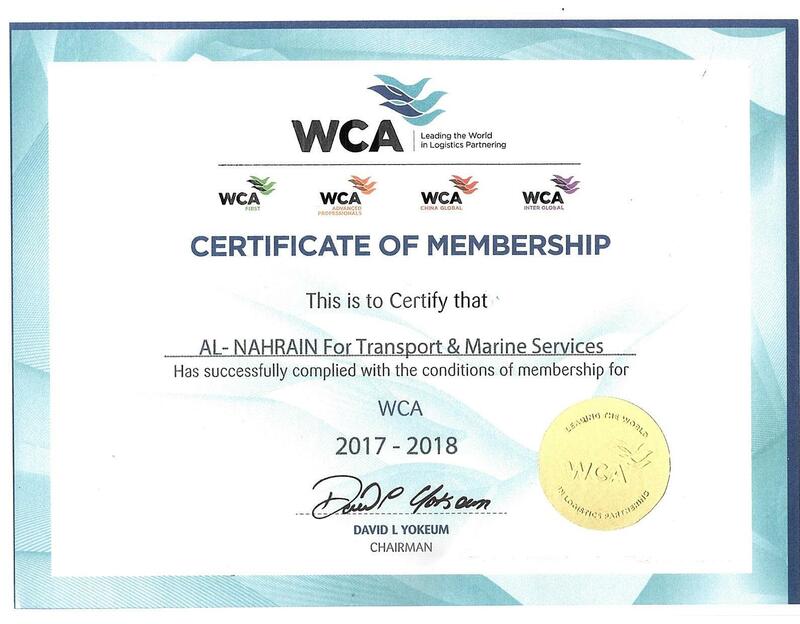 "We want you to know that we are very pleased with the quality of service Al-Nahrain For Transportation & Marine Services Co. provides. We sincerely appreciate their responsiveness, their diligence and the way they conduct business. We have recommended Al-Nahrain to others because of our satisfaction with their professional service. In our business we must get our products to our clients on schedule. 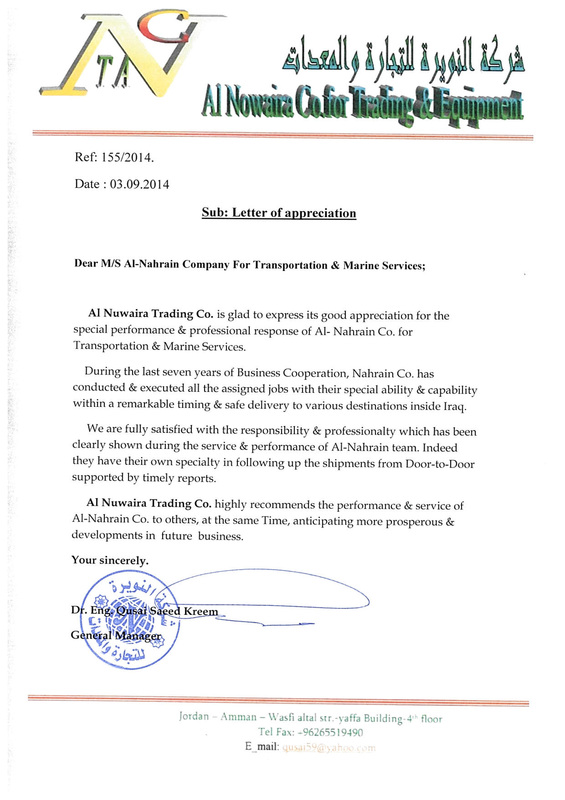 We rely on dependable service from companies like Al-Nahrain to help us satisfy our customers. We look forward to continuing our business relationship with them for many years. " 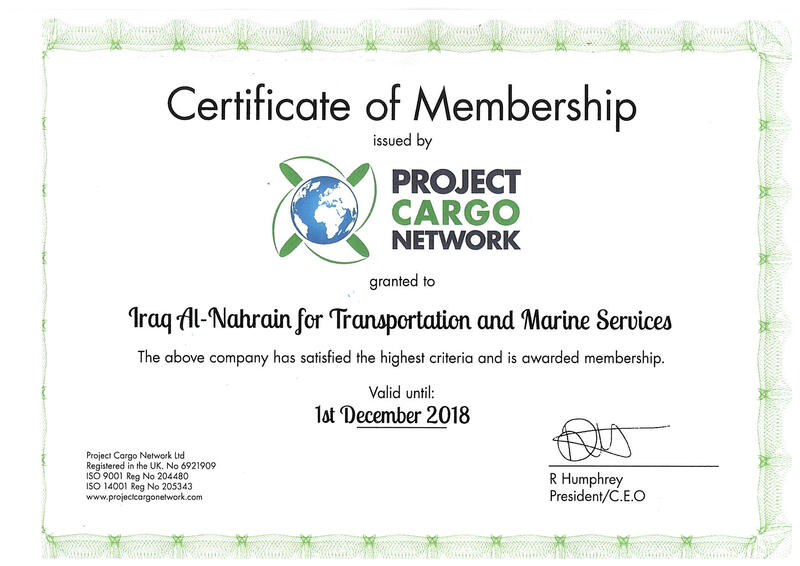 Vice President, North Shore International Inc.
"Al-Nahrain's ability in taking delivery of our materials, consolidating freight, processing customs formalities, arranging for all modes of transport, and repeating the process through all entry points into Iraq was timely despite the excessive volume of our shipments. Al-Nahrain's diverse range of services allowed us to use them as a one-stop shop partner for our transportation and logistics needs. 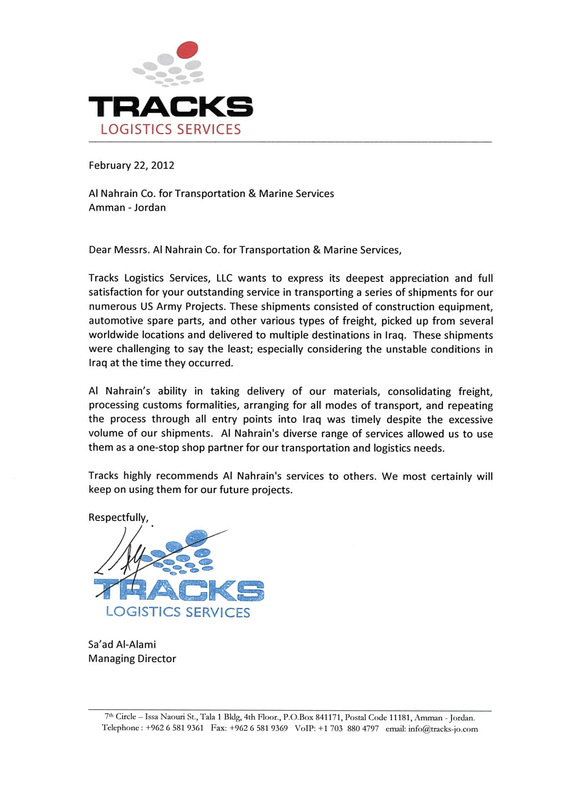 Tracks highly recommend Al-Nahrain's services to others. We most certainly will keep on using them for our future projects"
"We, Toyota Tsusho Corporation, a company organized and existing under the laws of Japan, having its principal place of business at 2-3-13, Konan, Minato-ku, Tokyo 108-8208 Japan, hereby express our appreciation for your performance in conducting and executing our shipments through the assigned jobs. We have been fully satisfied with your high international standard services for all aspects, time wise, safety wise, and the follow-up process, since you became our logistics partner long time ago"
© 2015 Nahrain Co. All rights reserved.